Fiat’s plans for the year 2013 are something very promising and Fiat’s 500 XL design code 330 is one of the much anticipated launches. Fiat 500 is known and loved for its retro styling and the 500 XL is the 7 seat version of this very popular car. The Fiat 500 XL has now been spotted testing in the Turin Suburb and that really is great news for some of the anticipated buyers. 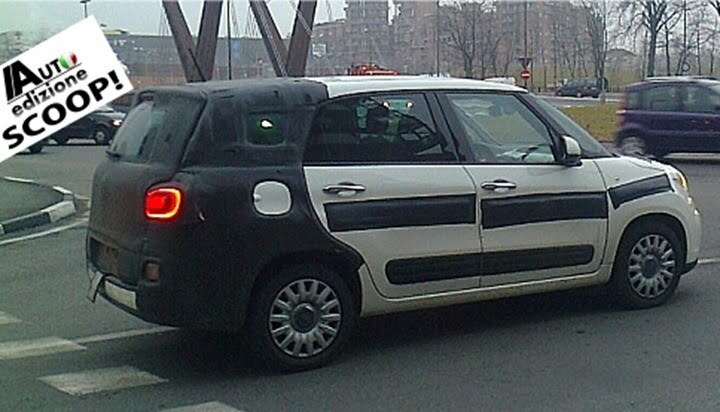 The Fiat 500 XL is basically the extended version of the Fiat’s 500L, the spy pictures of the test mule were taken by the Autoedizione.com. Looking at the pictures one can make out that the 500 XL takes a lot of its bits from the 500L and most of the parts are almost similar. The 500 XL in the spy pictures is camouflage only at the rear. The 500 XL looks ready to go under manufacturing procedure and if we believe the future set of information, the Fiat can surprise us by revealing the car at the upcoming Geneva Motor Show or in June this year. The Fiat 500 XL may be powered by the same engines which power the very famous 500L i.e. the 0.9 litre turbocharged petrol engine, a1.4 litre petrol engine or the 1.3 litre diesel engine. Not much information is revealed about the car but when launched it will take on the Chevrolet Spin or Honda’s Brio based MPV. Beside this MPV the Fiat is also developing a compact crossover based on the same 500L named the 500X and talking of its India launch, the Fiat has not revealed any of its plans to launch the MPV anytime before 2016. The MPV market is quite hot in Asia and South America where people mover cars are quite popular with large families as well as commercial buyers. Looking at the brand value of the Fiat 500, the 500XL may not be an entry level offering, but a premium MPV, but still it packs some good features and value proposition which may make it a successful seller. Stay tuned to Car Blog India for latest updates.